Destiny 2 Warmind was rumoured to bring back the days of Outbreak Prime and Black Spindle, Exotic weapons that required the community to work together to solve a puzzle in order to understand how to get them. In fact it goes one step further, and a puzzle in the expansion has actually led players to some real lift treasure. Who is e you may ask? Well it’s Elsie Bray, at least that’s the strongest theory from fans. This is Ana Bray’s sister, the new character joining the fight in Destiny 2, but she also seems to be the Exo Stranger from Destiny 1. Mention of the Exo program and Ana basically confirm this, and it’s quite a good link for those who were wondering where the Exo Stranger is. However, this secret also seems to confirm that the Stranger won’t be returning as a character, and hints that she doesn’t in fact shift only through space, but also time. Anyway, the coordinates lead to a location in Sleeping Beauty Mountain, upstate New York. This is also the location that Vicarious Visions are based, developers of the Warmind expansion. Here’s what one Destiny fan, When_I_Love_Science, found. Yes that is a spear based on the Valkyrie weapon in Destiny 2 Warmind. 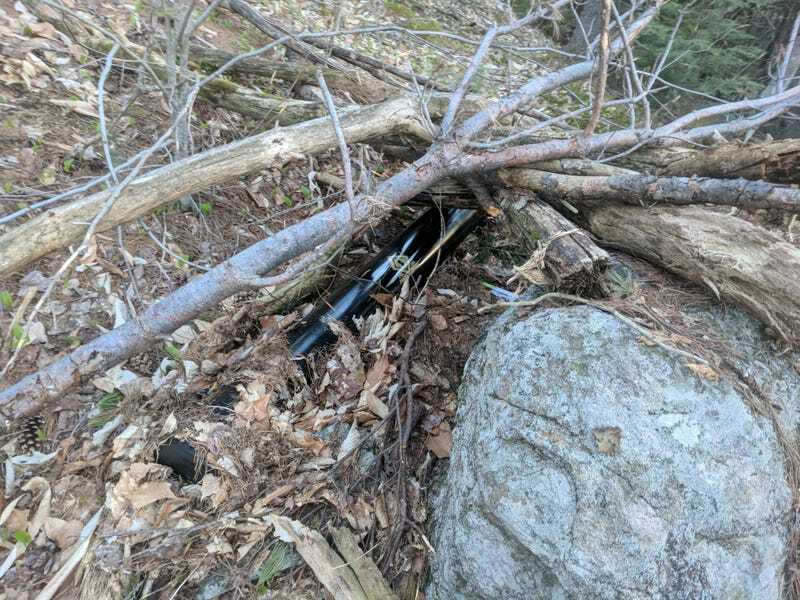 In the cache there were also gold coins and a guestbook for intrepid explorers to sign once they’d reached this point. 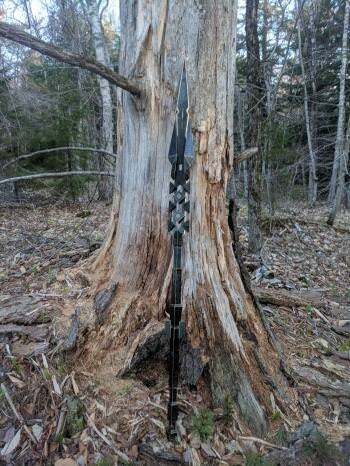 A note in the cache asked that only one coin be taken per person, to ensure that there is a reward for others who don’t get this incredible spear. It’s worth pointing out that there are only three of these spears in the world, one with Vicarious Visions, one with Bungie, and one with this one Destiny fan. 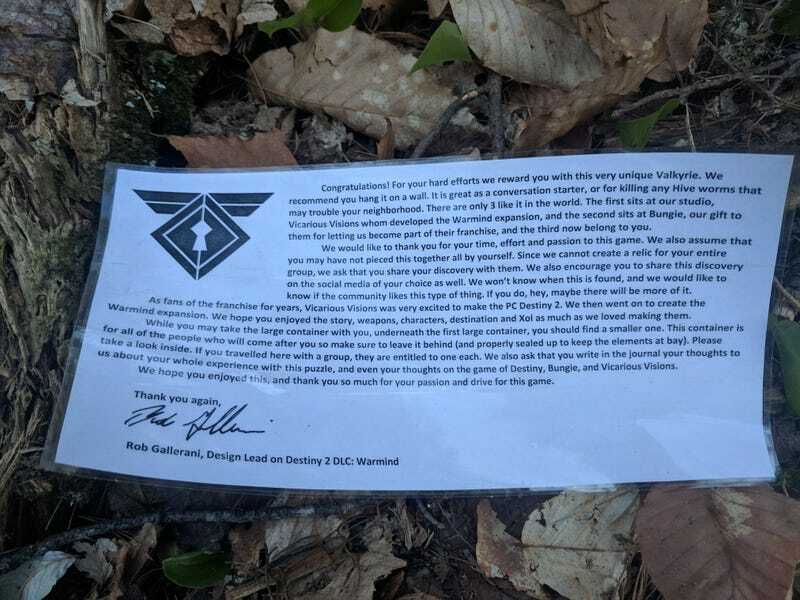 Here’s the note left to anyone who finds the cache. Let us know what you think in the comments.